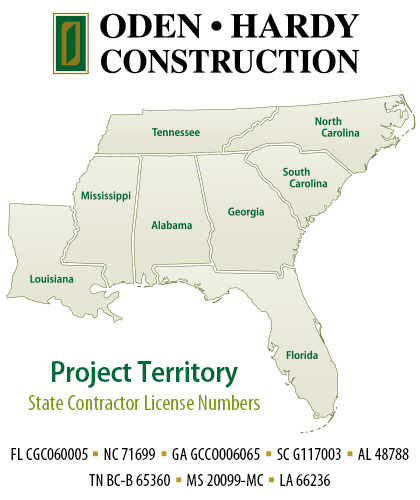 Oden • Hardy Construction is a general contracting company that specializes in design/build services and serves the entire southeastern United States. We provide a team of professionals capable of tackling the most demanding construction projects. Having the ability to meet aggressive schedules with the industry’s best professionals, subcontractors and staff, we work closely with our clients to determine their needs and provide the leadership necessary to ensure a successful project. It’s easy to understand why over 90% of our business is from repeat customers. Along with our solid knowledge and understanding of governmental regulations. Commitment. Integrity. Diversity. Each has its own unique set of criteria, yet when combined, create a successful project for even the most discriminating owner. The pros at Oden • Hardy Construction show you how our concepts and services can provide you with the knowledge and understanding to build your project, whether simple or complex. Integrity – Integrity is often overstated in the construction industry today. We do more than talk about the integrity of our company — we guarantee it. From the beginning, each client works with one of our principals, who is dedicated to providing the best services and products available. Commitment – We work wholeheartedly from the very start to ensure our clients understand the entire process from design, through permitting and finally with construction. We are committed to construction projects that are well-managed, built on schedule and completed within budget.